It’s the first half of the final episode. I need a tissue (I’m sure that’s just from the lingering cold). Tensions rise as the results are being tabulated. Kang Hwi looks worse and worse as the countdown begins. Oddly enough, he doesn’t collapses until AFTER the results are out. Take 2 wins the rivals competition and Kang Hwi’s light goes off just as he passes out. Since his side of the stage is dark, no one but the stage crew knows he has collapsed. When the light comes back on, he’s gone. Tae Ik is worried and the fans are chanting for Kang Hwi to come back out. Of course, fans are all gossiping about Kang Hwi’s rudeness. Poor Kang Hwi, he’s being misunderstood again. Joon makes a call telling people to immediately block all news about Kang Hwi and the competition and he will head back to the office soon. He then angrily rips down the rival poster. Bum Soo comes up and tells Joon to keep his promise and immediately vacate Full House. Joon’s response? Do you have proof? He then yells that if Bum Soo wishes to talk to him about things he should at least bring proof with him. Say what? You mean…they didn’t record the promise or get it in writing? Are they that stupid? Joon gets away from Bum Soo and turns to leave. Enter the very livid Tae Ik who grabs Joon by the collar. Tell him. Tell him now. No, it’s not about Full House, it’s about Kang Hwi. Did Joon know about his condition? Of course Joon neither says yes or no and just tells Tae Ik not to step out of line. Tae Ik then reveals Kang Hwi collapsed on stage and that is all Joon’s fault. Joon knocks Tae Ik’s hands away. So what now. Tae Ik only cares because he’s learned Kang Hwi is sick and going blind? No. Tae Ik has always cared, you just never knew it you sagaji. Of course, this is all news to Bum Soo who had no idea. He’s freaking out and demanding Joon tell him what’s going on. Joon knocks his hand away. Tae Ik then says that if anything happens to Kang Hwi, he won’t let Joon go. Joon yells at Tae Ik to go nurse Kang Hwi if he’s that worried. Wait. Isn’t Joon going to Kang Hwi? Of course not. He’s going to take care of “the mess” that “Kang Hwi” created. No. It’s the mess Joon created. Tae Ik lunges at Joon, but Bum Soo stops him and demands and explanation. At the hospital, Bum Soo, Man Ok, and Tae Ik are listening to the doctor who said that Kang Hwi did all the things that he wasn’t supposed to do. He overexerted himself and was under bright lights. Right now his condition is the utmost worst it could possibly be. Tae Ik demands to know about treatment. There is only a cornea transplant to save Kang Hwi’s failing vision and those are very hard to get in Korea. It will all take time. Bum Soo gets up and angrily wonders how Lee Joon could treat a sick kid like he did so that he came to be in such a state. The doctor tells them to contact Kang Hwi’s family right away. Well…Bum Soo doesn’t know their contact info. That’s okay, Man Ok does. This shocks Bum Soo and Tae Ik. How does she know? She met them once. So Hwa Ming is contacted. She promises to leave right away and immediately calls for a plane ticket. She then orders to be connected to Lee Joon immediately. I think big sister is going to be very angry since I’m sure she’s aware there is no way that Joon didn’t know. Meanwhile, are evil president is putting together news about how Kang Hwi fought his illness to guard the stage he loved. At this time, his secretary comes in and tells him he’s gotten a call from Hwa Ming. Joon then sends everyone out. The call comes in and Joon puts on his fake face and answers. Hwa Ming demands to know if Kang Hwi going blind is true. Joon laughs and says it is. How could Joon hide that from her. Joon blatantly lies and says that he didn’t know. But don’t worry too much. They will get the best staff to treat his eyes and Joon will do his level best to promote Kang Hwi’s album until he’s better. This annoys Hwa Ming. Here is a sick man and all Joon can think about is album promotions? Win will no longer invest in U Entertainment. Joon is also annoyed. So she will withdraw her investment then? Yes, because she can no longer trust Joon. Why is she getting so worked up? That’s right. Kang Hwi’s problem is a sensitive issue. Did Hwa Ming really think he wouldn’t learn the truth? Joon then claims he’s a victim who has invested tons of money in Won Kang Hwi. If Hwa Ming insist on pulling out the investment, he will take the Won’s story to the news. Hwa Ming only smirks. He dares to threaten their family? Threat? No, it’s just Joon’s promise to wrap things up. Hwa Ming says that she won’t allow Joon to get away with such things. It won’t work out like he thinks it will. She then slams down the phone. Joon puts down the phone and tiredly tells his secretary to prepare the conference. She goes out and Joon vows to tell the press everything. In the hospital room, the trio worry over the still unconscious Kang Hwi. Bum Soo berates himself for not knowing and not saving the poor Kang Hwi who must have been scared being all alone under Joon. Tae Ik tells him that they didn’t know so don’t feel too bad. Man Ok turns and apologizes for not telling them, but Kang Hwi demanded his condition be kept a secret. Enter the loveable Go Dong who announces there is a BIG problem. Why? An article came out. What article? An article about Kang Hwi becoming blind. Joon also has a press conference prepared for the next day. This shocks the three in the room and angers them. What nonsense is Joon going to do now with such a sick kid? Bum Soo goes to angrily rush out, but Tae Ik stops him. No good will come from getting emotional and confronting Joon. Kang Hwi wakes up and seems surprised to know that Bum Soo and Go Dong are by his side. Why wouldn’t they be? Aiyo. Kang Hwi doesn’t know how much he’s loved, does he? Kang Hwi asks about the broadcast. Was there an accident? Tae Ik speaks up. It’s not the first broadcasting accident that Kang Hwi has caused so there is no need to worry. Kang Hwi says that is true, but no everyone knows about his eyes. Go Dong looks away and Tae Ik trembles in anger. The news is released all over and fans are in a state of shock over the news. Joon goes to the press conference where he is met by Tae Ik, Bum Soo, and Go Dong. Joon yells at them to move. Tae Ik in turn yells and asks how low will Joon stoop. Joon wishes to go at Tae Ik, but his man stops him. Bum Soo agrees. Yes, Joon is sinking to an all time low. How can he do this to the poor, sick Kang Hwi? Bum Soo isn’t stupid as he knows that Joon will be using Kang Hwi to do business. So what? What Joon does with his singer is none of their business, plus what can they do to stop him? His men then grab our trio after Tae Ik vows it won’t go like he planned and keep them away from the press room. Joon enters and is completely shocked. Why is there no one there? Enter the chairman. He says that he cancelled it. Does Joon not know how big a family the Wons are? Haha. The chairman heard noise all over, but thought that Joon would take care of everything well, so he just watched from the side, but this is how he repays the chairman’s trust. Joon apologizes and the chairman says it’s too late and he’s done with Joon. He won’t seek legal reparations from the younger man so he needs to pack his bags and clear out of U Entertainment immediately. Joon says he can’t since he’s spent so much time and effort to bring the company to where it is. He promises to get back all that was lost, but the chairman has had enough of Joon’s failures. If he doesn’t plan on directly confronting the chairman (about what?) then he needs to quietly leave. The chairman walks out with Joon shouting after him. Do I feel bad for him? Not really. He made his bed and now he must lie in it. Joon collapses to the floor and our trio just turn their backs and leave. Bum Soo and Tae Ik then meet with the chairman and play the recording of Joon’s promise to give Tae Ik Full House if they win. So are they asking him to return Full House? That’s something they need to discuss with Joon. Bum Soo says he knows this, but Full House is technically U Entertainment’s property (and thus belongs to the chairman). We then flashback to the chairman introducing Joon to Mr. Lee and his family all those years ago. Joon had one a prize at that time. The chairman was the reason Tae Ik and Joon met. Bum Soo explains that Lee Joon used getting Full House back as a way to hold onto Tae Ik and the man did such horrible things to the boy. It wasn’t a slave contract, but the chairman should know it was a good contract either. How much profit has Tae Ik made so far? It should be enough to cover the purchase of Full House and still have some leftover. The chairman says he will give the house back under one condition. The condition? Bum Soo takes over U Entertainment. This shocks Bum Soo, but we all know that Bum Soo would do an excellent job taking care of the singers and actors under him. Joon sits in his office caressing his nameplate. He flashes back to when the chairman put it on the desk and asked him to make U Entertainment big. Joon gets angry and throws a fit, sweeping everything off his desk. How could that man do that to him? He doubles over and cries and screams. That will get you nowhere, dude. Se Ryeong goes into Kang Hwi’s room with flowers. He opens his eyes and can only see a woman’s outline and a vague outline of a bouquet. He thanks her and is surprised to learn it’s Se Ryeong. Of course. Who else would bring a loser such a big, beautiful, nice smelling bouquet? Kang Hwi thanks her and she tells him that Joon has officially resigned after doing all that evil stuff. Why is she there? Se Ryeong throws back Kang Hwi’s words about not letting her go downhill. How can she stop that? Kang Hwi asks if she is going to China. Soon. Kang Hwi says that she is at her best when she’s most confident. She needs to coolly say goodbye and leave. She doesn’t know if she can do that. Whenever she sees Tae Ik she gets all mushy. She doesn’t like that. Kang Hwi says it’s because she sincerely likes him that is why she can be sincere when she’s with him. I guess vindictive mushy stupidity = liking someone. Who knew? Isn’t that why Se Ryeong came back. Of course, Se Ryeong tears up and says it’s only because she’s upset that she can’t have him. Just you wait. She’ll coolly say goodbye and leave. She heads out of his room and Kang Hwi gives a small smile. It’s all bravado. Se Ryeong leaves as Tae Ik comes to see Kang Hwi. The two meet in the middle and go outside to have a talk. Se Ryeong says she was there to unmercifully tease Kang Hwi about losing to Tae Ik. She then reveals she’s going to China to work with the big name director. Tae Ik says he heard and congratulates her. Se Ryeong says she can’t just leave like this and must ask one last time. Will Tae Ik go with her? She looks over at him and asks what if she can help him achieve greater fame than he has now. If he rejects her offer now, he’ll regret it later. Tae Ik then turns to her and asks if she regrets walking out on him all those years ago. To him, to live with no regrets, he must protect and be with the people he loves. Se Ryeong understands this. It means she isn’t that person. Fine. As Jin Se Ryeong, she will let him go coolly. She fights back tears and holds out her hand. Tae Ik takes it and thus ends their relationship. Se Ryeong fights back her tears as she walks away. Se Ryeong then texts Tae Ik and finally reveals the truth about setting up the scene with Kang Hwi and using him to hurt Tae Ik since she was jealous of how much Kang Hwi protected and loved his partner. Jealous of friendship between men. sigh. Tae Ik then goes to visit Kang Hwi-nim. Babo. You should have listened to Kang Hwi. When Tae Ik goes into the room, he doesn’t see Kang Hwi at first, but then he comes out of the bathroom and Tae Ik catches him before he falls over. Tae Ik scolds him for not calling the helper ahjumma. Kang Hwi says he couldn’t since he is a world star. Is he feeling better? Except for being stifled in a hospital? Yes, he’s fine. He’ll be getting out soon anyways since there’s nothing to accomplish staying there. Kang Hwi then congratulates Tae Ik for getting back Full House. So, he’ll be moving in soon, right? Not yet. He has a few more things to take care of first. Kang Hwi then says he should vacate his basement room then soon since the rude owner is coming back. This shocks Tae Ik. Kang Hwi is going to move out? Kang Hwi says his mother wishes him to go back home. So he will go to China for the surgery? Kang Hwi nods. He says he was initially so angry that he didn’t want treatment or surgery and was in a state of giving up on himself. However, now that he can’t see well he realizes how inconvenient it is and will do his best. Tae Ik tears up and apologizes. This shocks Kang Hwi. Tae Ik just said he was sorry? Tae Ik then apologizes again for the misunderstanding five years ago. Kang Hwi laughs. Of course he wouldn’t move in on his best friend’s girl, plus he like puppy women, not foxy women. Still, Tae Ik is sorry. Does he think one apology will make up for all Kang Hwi suffered through? That is the past, what can he possibly do about it now? So nice to see their brotherly love and bickering! Kang Hwi then asks Tae Ik to grant his request. What request? It’s something only Tae Ik can do so he must grant it. Kang Hwi arrives at Full House, sniffs the air and smiles. Inside, Man Ok is cooking up a feast to celebrate Kang Hwi coming home. After the meal, they sit outside with raspberry tea which is good for the eyes. Kang Hwi then hands over a present to Man Ok. It’s similar to the hairpin that she didn’t end up buying in Japan. We flashback to that scene. Kang Hwi says that he already knew how Man Ok felt back then. He then tells her to quickly open the envelope. In it is a registration paper. Kang Hwi reveals that Hwa Ming loved her skirt and believes Man Ok will do well as a designer. Thus Kang Hwi registered her for classes to help her out. He wishes her to become a great designer just like his noona. He then promises to become her exclusive model if she becomes successful. She happily thanks him. 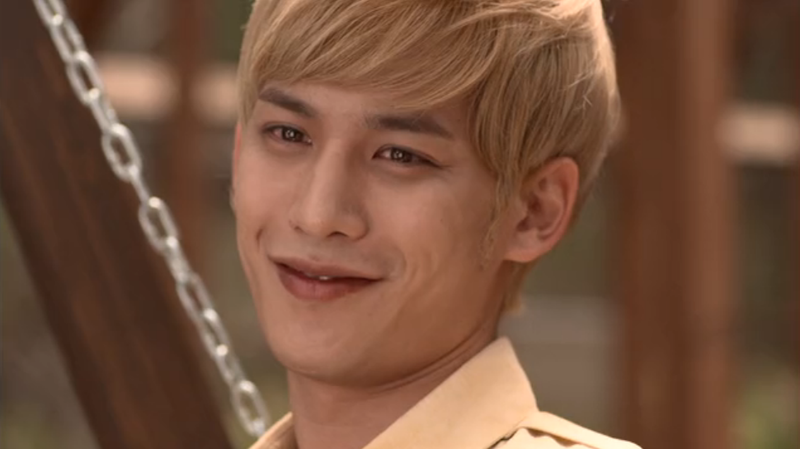 Kang Hwi’s smile fades and he says that he is also very grateful. He knows it was hard to remain by his side. She is no free to go wherever she wishes. Sniffle. End of episode. Tomorrow is the end. We shall have Tae Ik’s and Man Ok’s story wrapping up. Happy end, though I still feel badly for poor Kang Hwi-nim. Joon got canned! Yehaw ding dong the witch is dead. Snowflake let go of Tae Ik and reveiled that she forced Kang Hwi into a kiss years before. Good for her. And boy oh boy, Tae Ik and Kang Hwi have made up! Tae Ik even apologized. This is just what I wanted. My still heart hurts from Kang Hwi’s gift to Man Ok and how he let her go. T’was an awesome episode. I’m happy that things are being wrapped up nicely and it doesn’t feel too rushed. and the last preview is just goood! Tae Ik visits Kang Hwi in China, so adorable!